My 6 day trip to Whistler, BC, earlier this month took me to the Adventure Travel Trade Association's annual Summit conference. Yes, the ultra cool mountain ski village is beautiful in the fall, and a great relaxing place for a meeting. I attended the meeting to learn more about the growing niche market of Adventure Travel & to make job contacts there. Attendees included tour operators, travel agency specialists and travel media from all over the world. The weather was typical mountain fall, including rain, mist, fog, sunshine, and even a few great views of the nearby mountain peeks. I stayed at the Pan Pacific Mountainside hotel, about a minute away from the gondola to the top of the extremely steep mountain. The hotel gets rave reviews & high stats as a resort from publications like Conde Naste. We got really good rates as association members. My hotel included an Irish bar with lots of good music, Irish & folk, sung by Guitar Doug. Whenever Doug asked if everybody was tired yet, the crowd enthusiastically yelled, "No!! ", so he kept on singing. The halibut, salmon & corn beef was delicious. Since the bar got some bad beer kegs, the usually great tap beers, Harp & Molson, were not available. Eeeeeeekkkkkkk! I spent every night in the cozy Irish pub, with a nice warm fireplace, before going to bed. We had 3 nights of entertainment & specialty foods at the conference including a Canadian night & Alps night (featuring France, Germany, Italy & Switzerland). 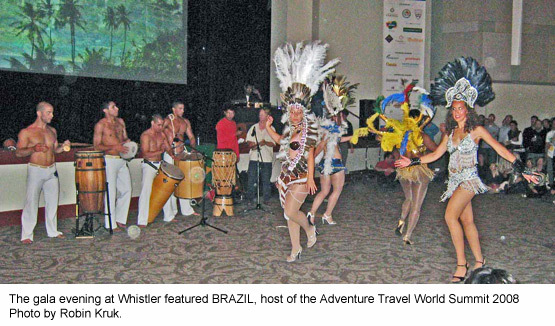 My favorite party was hosted by Brazil, which included a fabulous Samba band & dancers. The conference was held at the convention center located in the Village Stroll area, about a 10 minute walk through the picturesque town. There wasn't much time for enjoying the area since the Summit meeting did provide a lot of information packed sessions on trends & marketing in the Adventure Travel business. The gondola ride to the top of the mountain took 25 minutes where I traveled through rain, snow and fog to the snow packed top of the ski area where the Olympics will be held in 2008. I'm a Canadian aviation historical researcher and am presently researching the activities of Canadians in the Korean Air War (1950 - 1953). This is a broad-based topic but involves the nearly-700 charter flights by Canadian Pacific Airlines from Vancouver to Tokyo via Anchorage/Shemya(in the Aleutians) /Tokyo. On 20 July 1951 one of CPA's DC-4s with a crew of 7 and 31 passengers disappeared near Juneau and after an extensive search - was never found. "The ribbons of steel that made up the Kettle Valley Railway are gone. All that is left are 16 km (9.9 mi.) of track, the odd station house and out buildings, a few relics and the history. The Kettle Valley Railway was the tie that bound the Kootenays to the rest of British Columbia. The Kettle Valley Railway started at Hope and went all the way to Midway, zigzagging throughout the south western sections of B.C. From Hope, the KVR made its way through the Coquihalla River gorge. It continued onward to Princeton, West Summerland, Penticton, along the south side of Okanagan Lake and finally south to Midway, for a total of 525 km (325 mi.). They constructed branch lines to Merritt and to Osoyoos, making the line complete. " Dear Kathleen. Please visit our Africa Travel Association (ATA) web site, which has a page listing the main contacts in the USA for African National Tourist Offices, with links to embassies and airlines serving Africa from the USA and Canada. http://www.africa-ata.org/african_tourism.htm . We've also passed on your request to ATA head office in New York City. We are currently working on an update on Open Skies with the latest comments from exprts around the continent and overseas. Another project is taking place soon in the Caribbean, reparding flights to Africa via these exotic islands. We will keep you posted. http://www.airhighways.com/footloose.htm which has many pages of information and a wide variety of scenes from Vancouver and area. Have you any info on a company which offers romantic accommodations on one of three houseboats in BC? They were featured on tv last week. Sicamous is on Shuswap Lake, a short scenic drive from Vancouver via the Coquahalla Highway and Kamloops, BC - or go via the Okanagan Valley (wine country). Our Editor has vacationed there many times and loves the area. Let us know how you make out, and if you go, please send us a story and one or two photos for our site and magazine.